Every city in the country had at least one store that was known as the "5 & 10". Originally these store advertised, "Nothing Over 10¢." As you may surmise it has been many years since this advertisement was true. In the 30's it would be safe to say that the most expensive items reached the $1.00 limit. The "5 & 10" carried a multitude of various items, some similar items could be found in each store. There was a sewing goods section for the women along with cosmetics, housewares, notions, jewelry, inexpensive clothing items and usually a counter that held nothing but hair goods. The men that shopped in the "5 & 10" usually went to a counter selling hardware, electrical supplies, ties or the stationary counter. There was always a candy and a cookie counter and in the larger stores a fountain. 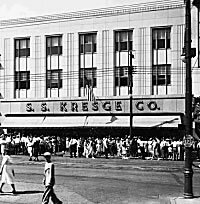 In addition to the large stores like F. W. Woolworth and S. S. Kresge stores there were many smaller chains and independents that went into neighborhoods where the larger stores did not. The "5 & 10" was an excellent place to go to pass the time away. One could walk up and down the aisles and look at the myriad of items that were for sale. A good inspection could take a half an hour. If a sudden rain came up in the "downtown" sectional the "5 & 10s" would be crowded. Each counter in each store had at least one clerk behind the counter. Some counters that did more business might have two, or three clerks behind it. During my many visits to a "5 & 10" in the 30's I can never recall seeing a man serving behind a counter. Men exclusively held the position of Manager, or Asst. Manager. I guess no laws were violated in those days. Today I imagine that any policy of that sort would result in a never ending stream of lawsuits.